Meet, engage, and enjoy the heartbeat of campus. This premium facility offers a variety of spaces for everything from a business meeting to a wedding. Below are descriptions of each of our reservable spaces. As always our knowledgeable staff are available to assist you with your event planning needs. The Ballroom is the largest meeting space in the Wayne State University Student Center. This versatile event space is equipped with a state-of-the-art AV system with dual projection and can be divided into three rooms depending on your event needs. The Ballroom hosts events from performances to career fairs and banquets. Known for their high ceilings and spacious design, the Hilberry Rooms are named after Wayne State's fourth president, Clarence B. Hilberry who served as University President from 1953-1965. 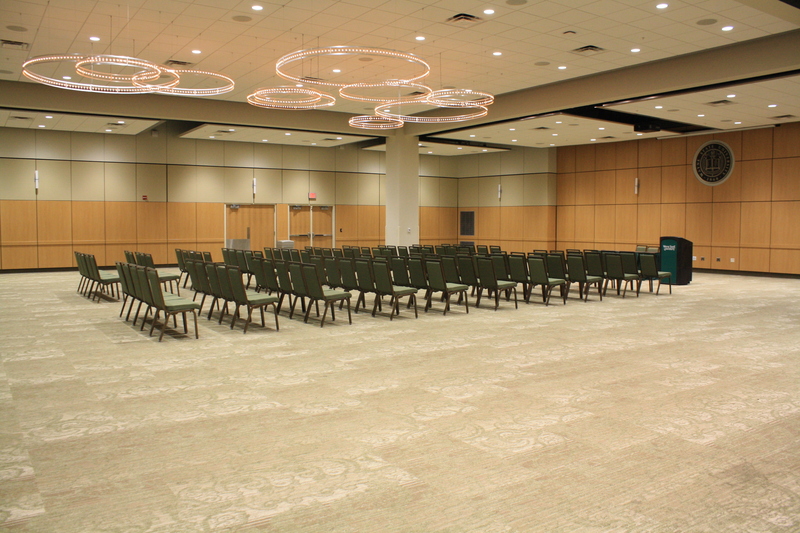 This versatile event space is commonly used for workshops, career fairs, lectures, and banquets. Hilberry A, B, and C can be combined for events requiring more space. Known for their high ceilings and spacious design, the Hilberry Rooms are named after Wayne State's fourth president, Clarence B. Hilberry who served as University President from 1953-1965. This versatile event space is commonly used for workshops, career fairs, lectures, and banquets. Hilberry D features floor-to-ceiling windows with electronic shades and side entry from Hilberry E.
Known for their high ceilings and spacious design, the Hilberry Rooms are named after Wayne State's fourth president, Clarence B. Hilberry who served as University President from 1953-1965. This versatile event space is commonly used for workshops, career fairs, lectures, and banquets. Hilberry E & F can be reserved together or separately and exits into the buildings 2nd floor south lounge. Student Center Room 285 is one of the most flexible spaces in the Student Center, featuring retractable auditorium seating and Blu-ray DVD capabilities. Hosting a large event such as a lecture series, film-screening or graduation? If so, this is the space for you. Community Arts Auditorium has a state-of-the-art projector, stage lighting, sound system and can accommodate more than 560 guests. The Outer Gallery is a great place for book signings, meet-and-greets and networking. This historic church, now decommissed, was constructed in 1886. Wayne State University purchased the church and it is currently used as a reservable event space. St. Andrew's Hall can accommodate up to 200 guests in lecture. The beautiful interior is something you must see for yourself. Gullen Mall is divided into three reservable spaces. The Flagpoles/Undergraduate Library Court is the most popular space, with a prominent location for your next event. The Fountain Court is nestled around a large fountain in the center of a green space area with benches. The Linsell House grass area is directly in front of State Hall and features a large green space. Student Center Reservations reserves bake sale locations in State Hall, the Student Center, General Lectures and Old Main. Contact us for any questions about bake sale policy and procedures. State Hall houses one large showcase on the first floor for student organizations to promote themselves or their next event. The Showcase can be reserved on a one week basis to recognized student organizations. View showcase measurements. The Student Center has one vendor table available for external clients to use to promote their company or sell tangible goods. View vendor information.